We have an embroidery machine! It's a Brother SE400. Make sure the fabric is very tensed (Brother actually recommends to use a stabilizer product). You may want to loose the upper thread (setting it on 2 seems to work well). In order to embroider, you need to obtain a .pes file. This is a proprietary file format used by Brother machines. It's a vector format that includes individual stitches, thread colors, etc etc. We've been using SewArt, which costs money, but has a 30-day free trial. The trial has enough features to do this, to the point where I'm not sure anyone will buy it. It's windows-only, but you can download free windows 10 isos or virtual machine images nowadays. To import images with SewArt, File > Open a normal image file. Tools > Resize to make it fit the embroidery size (supposedly 4" by 4" ~= 100m by 100m, but I think it's a little smaller than that). Then Tools > Convert to stitches to create stitch information. There's a lot of options here, but probably what you want is "Auto-sew Image" in the top right, then "Set Transparent Color" to avoid stitching a whole background. Finally Save As to generate the .pes file. A couple of alternative projects have bubbled up for working with pes files on linux and the ilk. Plug in the USB cable to a computer. You'll be able to mount it as a disk. Move the .pes file onto the disk. I think you can unmount and unplug it at this point, but I'm not sure. Get to the main interface on the LCD screen, click (it's a touch screen) the icon with the USB symbol, and click your image. Then click the weird icon above it (?) 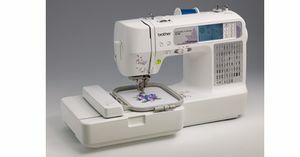 , thread the machine with the first color, lower the head, and press the down-facing green arrow button on the machine. It will stop once it finishes the first color to allow you to thread the second color, if there are multiple colors. The thread may break. Rethread it and it will keep going. We've found that turning the tension dial up to 5ish is best for thick fabric. This page was last edited on 13 March 2019, at 16:50.